Cable remains one of the most popular options for household and businesses using television and internet. The Federal Communications Commission (FCC) estimates that even with the decline in cable subscription, over 50 million subscribers still prefer this as their source of entertainment, news and other content. Even with increasing competition in the TV and internet segment, cable companies remain the biggest players due to the infrastructure and customer already established. 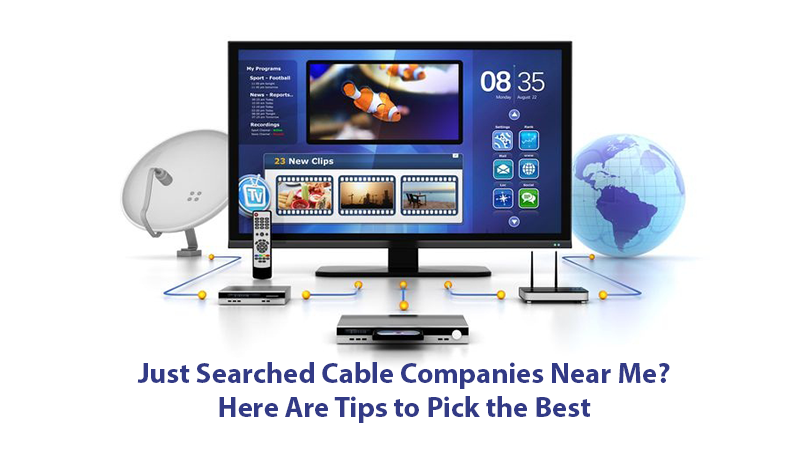 Now, if you have plans to move to a new city, it is important to search “cable companies near me” and identify available services. Likewise, if you would like to explore alternative cable TV or internet providers, it is easy to do so using your zip code. The problem is that with so many cable companies around, choosing the best is not a daunting task. This article offers tips to help you make the right choice and enjoy reliable cable and internet services. Read on. A decade ago, searching for a new cable company was a herculean task. There was little information about the service providers in the market and such data was not always objective. Many consumers had to stick with the big cable TV and internet companies despite their unreliable services and shoddy customer support systems. Well, things have changed and if you wish to switch to a new cable company, you can use an online search platform to identify available providers using a Zip code alone. These search platforms offer more than just available cable companies but also links to the companies’ websites. You also find a lot of invaluable information to help you make an informed choice. You will find objective reviews, price comparisons, customer ratings and other data to help consumers make the right choice. Through a simple search, you can get price deals, more reliable TV services, a broader range of channels, reliable customer services and other things from other cable companies. If you want to learn more about cable companies in your area code, visit a reliable TV and internet service search tool like Cable Papa and find everything you would like to know. How to Find the Best Cable Company in Your Area? A needs assessment is crucial if you want to identify the best cable service in your city. Don’t rush to switch to a new service provider without an idea of what you want. You need to list down all the services you would like from your cable service including the must-have channels, internet services, recording device among other. You might realize that even with over 150 channels on your package, you only watch 10 and yet you have to pay for all the others. Don’t allow the hype of new service providers lure you and instead, make a decision based on your needs. One of the major complaints against cable service providers is poor customer service. According to FCC, most cable companies fare poorly when it comes to resolving customer problems. The last thing you want is to switch from your current cable provider to end up with another company that offers poor customer services. Read customer reviews and testimonials to assess how reliable every cable company in your area is when it comes to resolving customer issues. Ask the cable company representatives if they have service centers in your home area. This increases the chances of faster resolution of technical problems with hardware. If you plan to move to a new city or you wish to change your current cable company, don’t rush and instead talk to other consumers. These include family and friends, work colleagues and your neighbors. It is easier to identify the best cable providers in your area through referrals and recommendations because the information you get is objective. The internet has revolutionized every aspect of life and that includes buying and selling of services. Consumers today can research any product or service before ordering and this applies to cable services. There are independent online search tools which allow you to find all cable providers in your area and also give more crucial information. Armed with such crucial information, it becomes easier to make the right choice. These search platforms also save you time and also give you links to cable companies available in your area. Bundled TV, internet and phone services are now a standard feature with all cable companies. When shopping for a new cable service provider in your city, look for the bundling option and do the maths. Don’t rush to sign up but instead consider whether you need individual services or whether the bundle can save you money. If you already have an internet connection, then bundled packages might not make sense. When comparing cable companies around your home, you need to consider the reliability of their services. You should consider uptime, coverage in your neighborhood, customer services among other factors. You don’t want to sign up with a cable company whose services are always down. Cable companies roll out the red carpet for new customers and you should leverage these promotional offers. Compare the introductory offers from different cable companies and pay attention to the details. Read the fine print to avoid getting locked in with an unfair contract. Other things you should consider when looking for cable companies in your area include extra services offered such as free installation, free modems, DVRs and other hardware. Look for hidden fees such as Regional sports fees, broadcast TV fees, additional receiver/multiple TV fee, and cancellation fees among others and avoid them. Make sure you talk to a customer representative and get clarification on all issues and don’t shy away from negotiating and asking for any available deals.